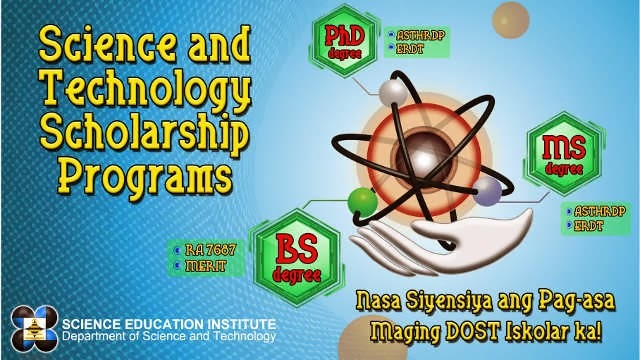 Department of Science and Technology (DOST) Secretary Mario G. Montejo announced on Wednesday, March 5, 2014 the availability of scholarship slots for academic year AY 2015-2016 S&T Undergraduate Scholarships. The nationwide scholarship examination is set on September 21, 2014. The scholarship is open to all qualified graduating high school students from public and private high schools nationwide. DOST offers two types of undergraduate scholarships - RA7687 for qualified applicants who belong to families with low socio-economic status and MERIT for qualified applicants regardless of their families' socio-economic status. 2. poor, talented, and deserving student who belongs to a family whose socio-economic status does not exceed the set values of certain indicators. 4. member of the graduating class of a DOST-SEI identified or DepEd recognized science high school. 3. member of the graduating class of a DOST-SEI identified or DepEd recognized science high school. Application forms can be obtained at Science Education Institute, 2/F Science Heritage Building, DOST Compound, Bicutan, Taguig City, DOST Regional offices or can be downloaded at its website, www.sei.dost.gov.ph and www.science-scholarships.ph. Accomplished form can be filed at the SEI or DOST Regional Office/PSTC nearest the applicant's school or home address. DOST announced that deadline for filing of application and requirements is on August 22, 2014. Qualifiers of DOST scholarship may pursue a four- or five-year college degree in priority science and technology fields. The scholarship qualifiers can enroll in state universities and colleges and other higher education institutions recognized by the Commission on Higher Education as Centers of Excellence or Centers of Development, wherein they can take up priority science and technology courses such as Agriculture, Agricultural Biotechnology; Agricultural Chemistry; Agricultural Engineering; Applied Mathematics; Applied Physics; Biochemistry; Biology; Ceramics Engineering; Chemistry with Applied Computer System; Chemistry with Materials Science and Engineering; Chemistry Engineering; Chemistry; Civil Engineering; Computer Engineering; Computer Science; Electrical Engineering; Electronics and Communications Engineering; Environmental Science; Fisheries; Food Technology; Forestry; Geology; Geodetic Engineering; Industrial Engineering; Information Technology; Manufacturing Engineering; Materials Engineering; Mathematics; Mechanical Engineering; Metallurgical Engineering; Mining Engineering; Molecular Biology and Biotechnology; Physics; Physics with Applied Computer System; Physics with Material Science and Engineering; Science/Mathematics Teaching and Statistics. The DOST-SEI Undergraduate Scholarship Program is the Department’s response to its mandate of accelerating the pace of knowledge-driven development in accordance with the S&T human resource growth potential in the country. TheSummitExpress will post on this page the results of September 2014 DOST-SEI Scholarship. Follow Us on Twitter or Like Us on Facebook for more updates related to DOST Undergraduate scholarship.